In this interactive workshop, experienced grant writer Willa Mays of the Blue Ridge Parkway Foundation presented on finding grants, appropriate writing, budgeting, and reporting. Highlighted granting organizations included WNC AgOptions, Blue Ridge Women in Agriculture, and Blue Ridge Seeds of Change. Grant searching and writing resources. Grant writing presentation powerpoint by Willa Mays. We were able to provide Holly with a small grant for this endeavor thanks to the generosity of the Appalachian Women's Fund. 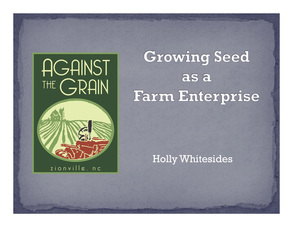 Holly's passion for seed saving extends far beyond the economic benefits. The presentation she gave on Jan 24th demonstrated this love and commitment to seed saving while highlighting the obvious, and not-so-obvious, benefits of this ancient art. Blue Ridge Women in Agriculture had an Educational Farm Tour followed by a “Women in Ag” potluck gathering. Kristen & David Travis of Old Season Farm in Ashe County discussed Kristen a unique approach to water and weed management in their hazelnut orchard. The swales constructed on their land were funded by a BRWIA Grant.